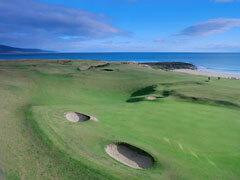 Brora Golf Breaks. Brora Golf Course - In 1923 James Braid, five times Open Champion and a prolific designer of golf courses, visited the course and redesigned the 18 holes into a par 72, 6,217 yard layout which has stood the passing of time and remains a fair and challenging test of true links golf. Brora presents all the attributes of the Scottish seaside links, ensuring that you use every club in the bag. 18 holes. Par 72. 6,217 yds. Links.